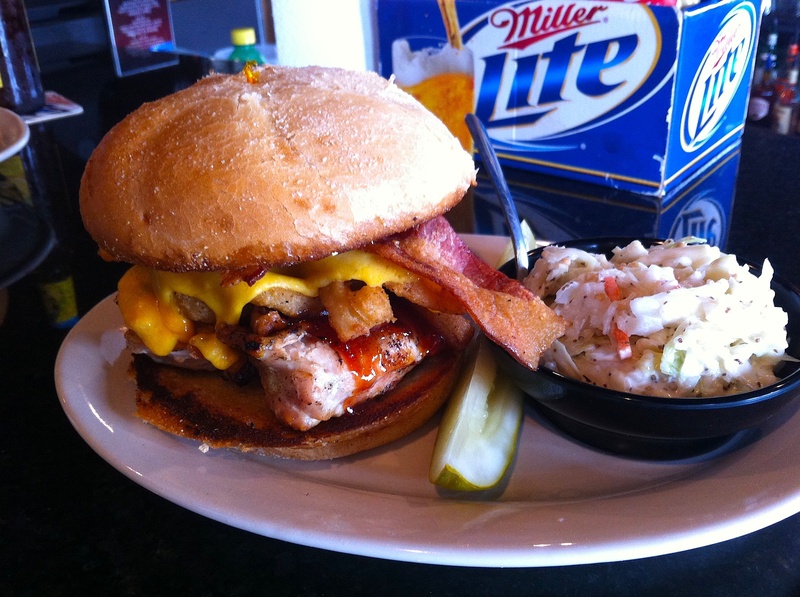 On Saturday Victoria and I left her Aunt and Uncle’s place at 2:20 and went to The Boneyard Pub & Grille for lunch. It’s in Sussex and they’ve got a wealth of flat screens, making it an ideal place to watch a game. I had the Cowboy chicken sandwich, which consisted of a chicken breast topped with deep fried onions, bacon, cheddar cheese and barbeque sauce. It was very good. We watched the first quarter of the Badgers game and left at 3:30 for Miller Park. Ed, a twitter follower, had given me his two tickets in section 116 for the game so I was going to try and sell mine for a donation. 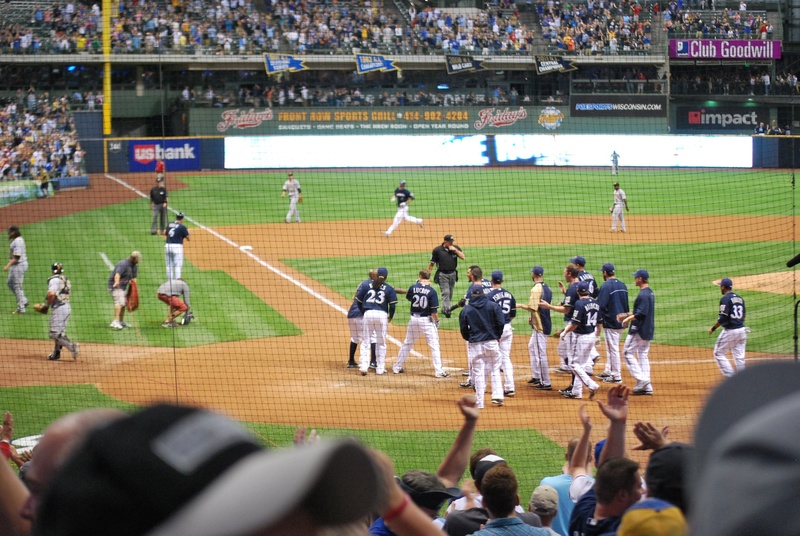 I don’t know if it was the Badgers game or the Brewers’ record, but there weren’t too many people buying tickets. 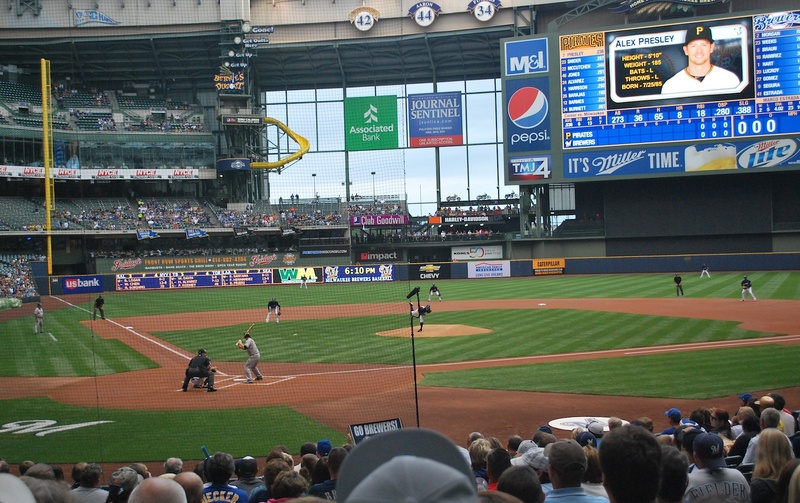 I was outside Miller Park for over an hour before finally getting somebody to buy my two tickets. It helps that I’ve got a good story to go along with it. 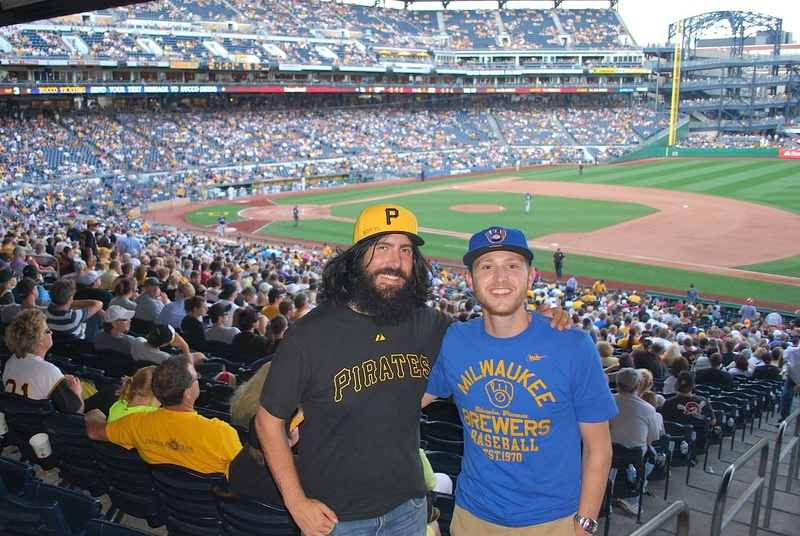 The two Pirates fans I sold my tickets to had actually seen my interview on Root Sports Pittsburgh last weekend. The Pirates fan paid me $60 for the seats which will wind up as a donation to Be The Match. Thanks for the donation! I stopped by a tailgate and then went inside at 5:30. I met Victoria in our seats and we went over to the aisle between sections 117 and 118 for game photo number 132. After Saturday’s game there are only 13 home games left! Where has the season gone? We went back to our seats and waited for the game to start. 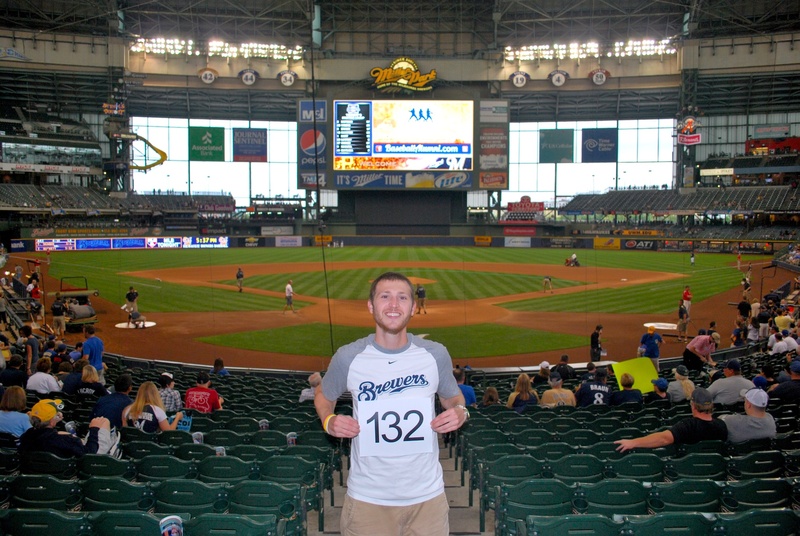 Ben Christensen, the former MLB Fancaver with the MLB tattoos, was at Saturday’s game and he was sitting in section 113. Victoria spotted him in the cross aisle behind us and I went back to say hi. 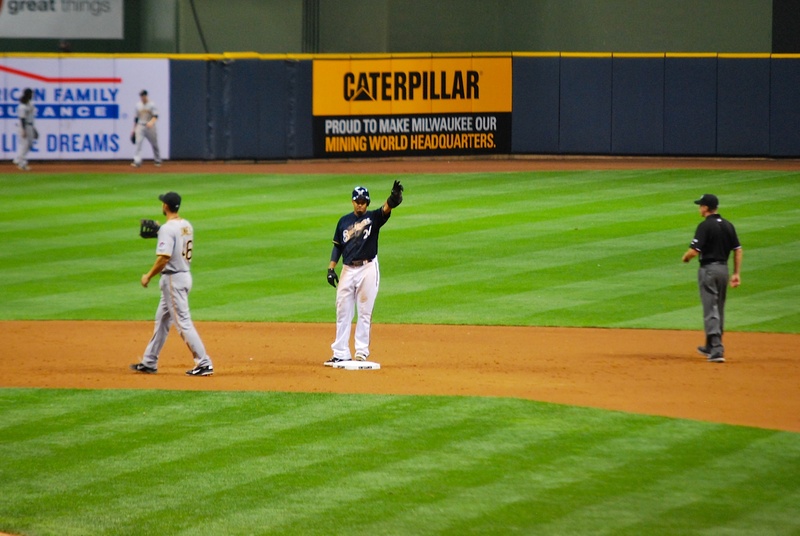 It was his first visit to Miller Park and he was impressed. 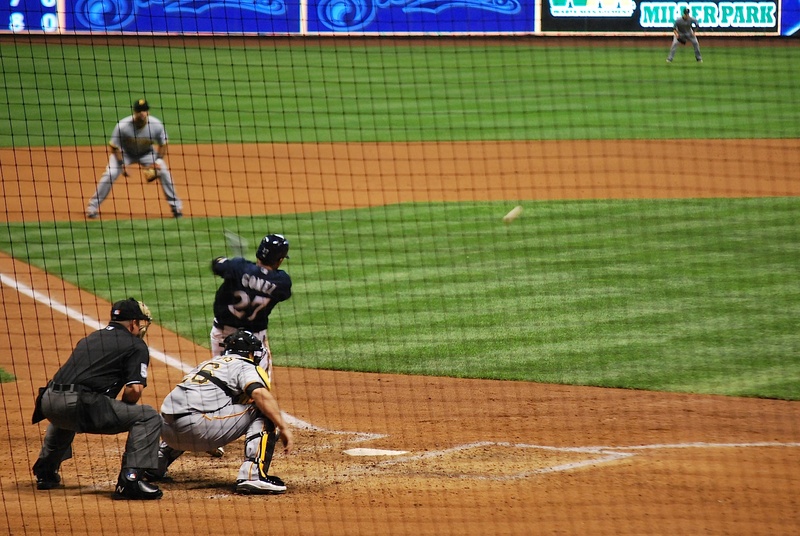 The game got started and Marco Estrado delivered a called strike to Alex Presley. While Marco Estrada was batting Pirates starter A.J. Burnett threw a wild pitch and Gomez was able to score the tying run. Burnett wound up walking Estrada on four pitches, also a no-no. 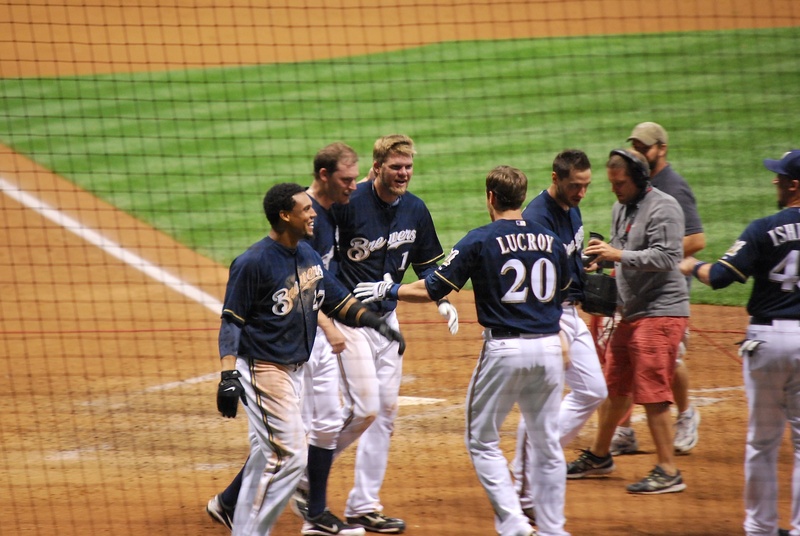 The one run is all the Brewers got in the 3rd and the game remained tied. 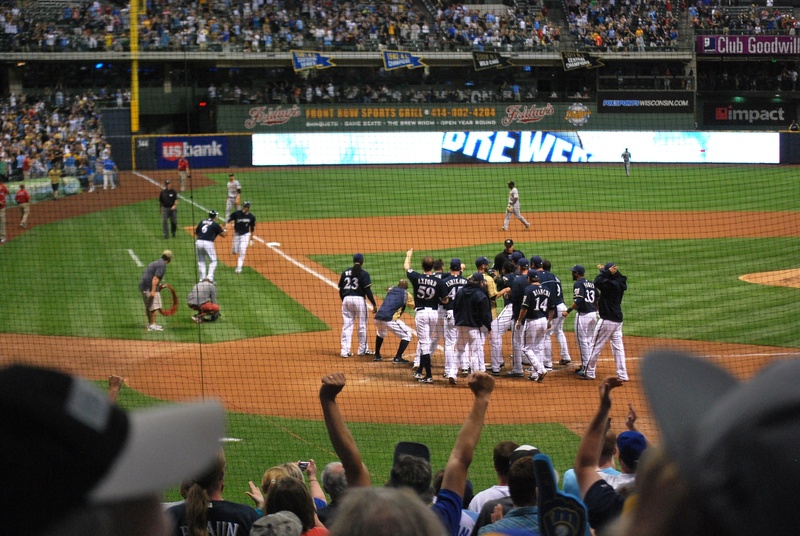 Burnett had a no-hitter going until Rickie Weeks singled with two outs in the 6th inning. 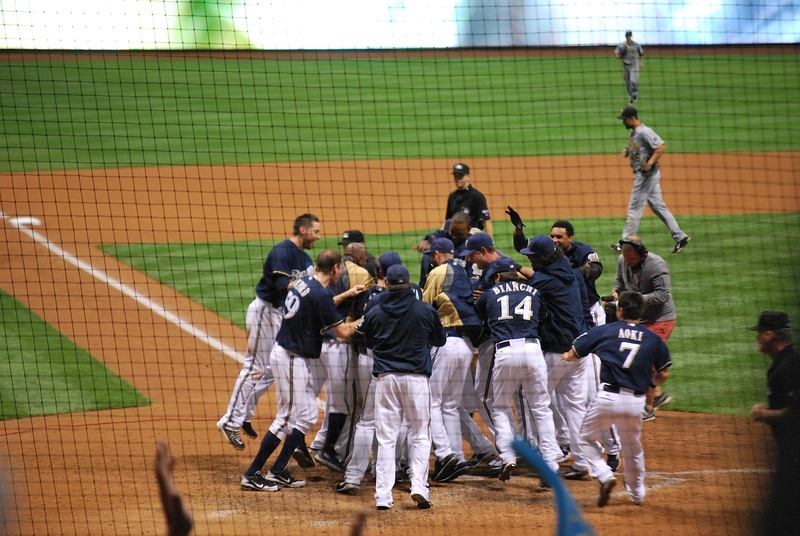 It made it all the way to the wall and Gomez had a stand-up double that gave the Brewers a 2-1 lead. Jim Henderson pitched the top of the 8th and walked the first guy he faced on four pitches. “Here we go again” was echoing in my head. A sacrifice bunt and a strikeout brought McCutchen up with two outs. Henderson jammed the Pirates’ All-Star center fielder and he broke his bat. 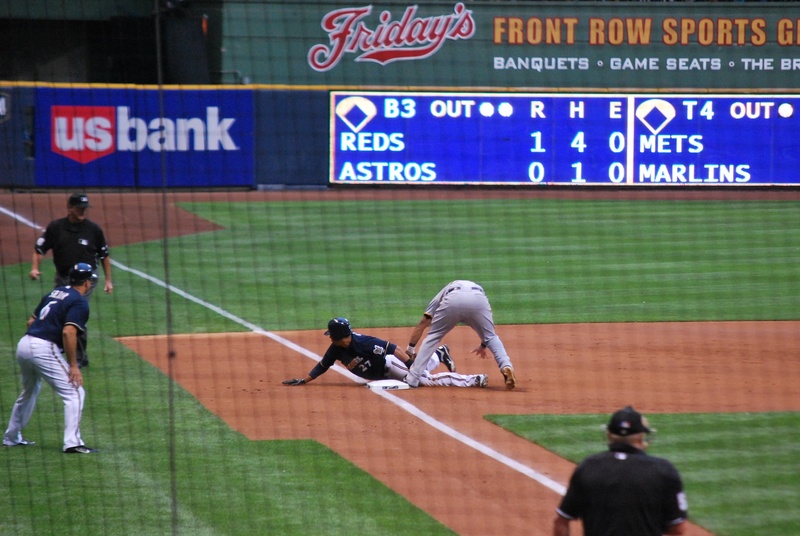 Unfortunately he got enough of it and the Texas-leaguer fell between Rickie Weeks and Carlos Gomez in centerfield and the game was tied at two. Not much you can do about that but walking the first batter of the inning allowed a run to score on the play. 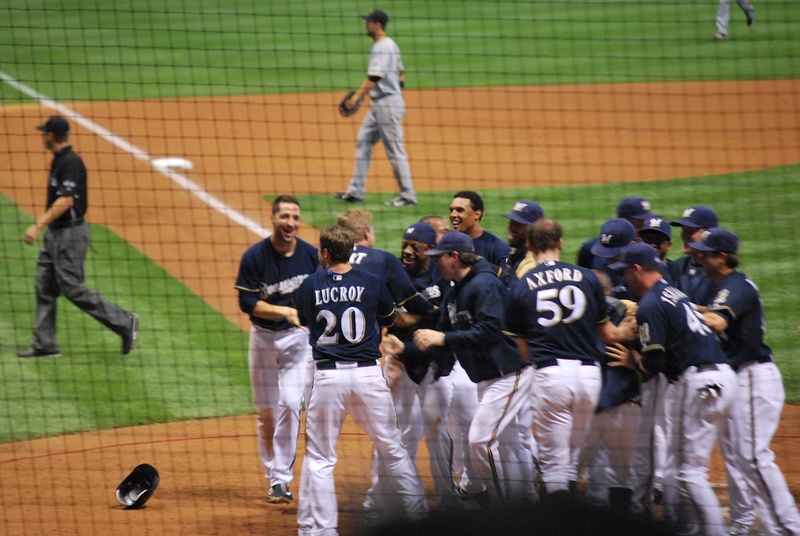 The Brewers failed to score in their half of the 8th and Axford pitched the 9th inning to try and keep it a 2-2 game. 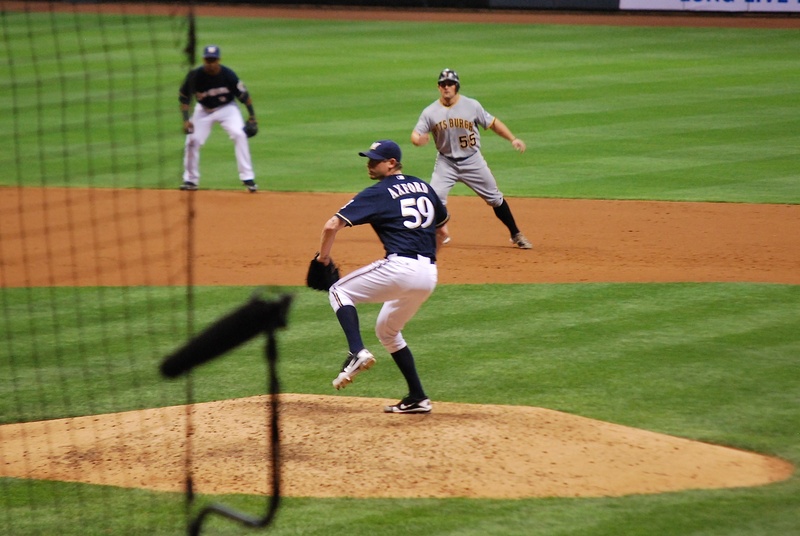 A two-out single followed by consecutive walks put Axford in a tough spot. Presley took a ball but then Axford threw three straight called strikes, getting out of the jam without allowing a run. Here he is before delivering the final pitch of the at bat. Corey Hart was due up first in the bottom of the 9th inning and I told Victoria “How about Hart hits the first pitch for a home run?” Long story short that didn’t happen. The Pirates closer, Joel Hanrahan, was on the hill and he throws gas (pitches very fast baseballs). Hart took a 97 MPH fastball for a called strike but then Hanrahan hung an 0-1 slider. I’ll let the next 8 pictures tell the story. That’s Hart getting interviewed after the game. 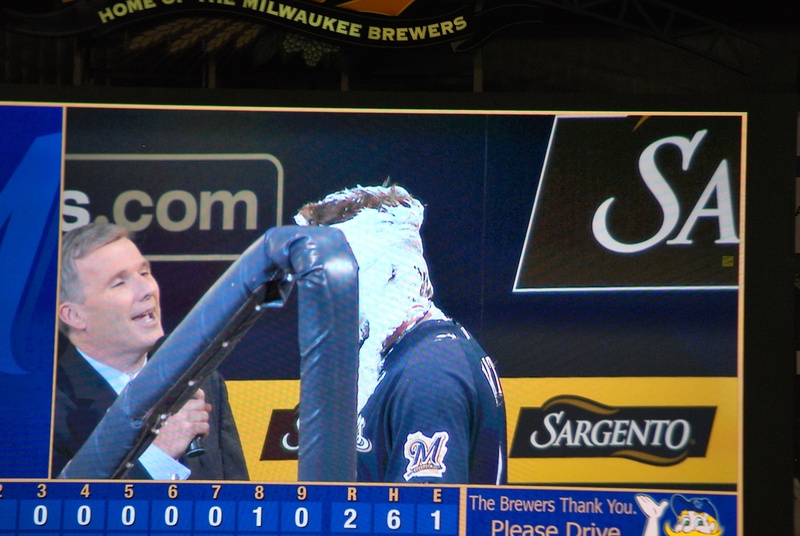 We didn’t see who shaving-creamed him, but it’s funny nonetheless. 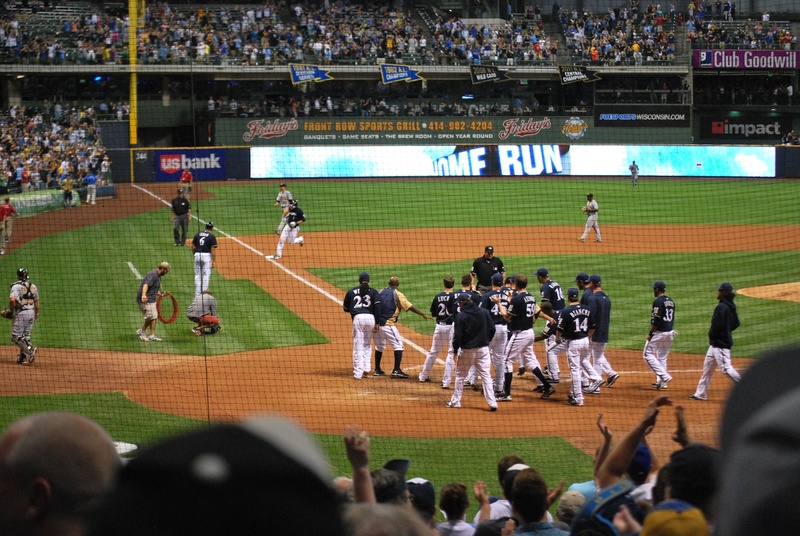 Hart had hit a walk-off home run to left field and the Brewers secured another series victory. 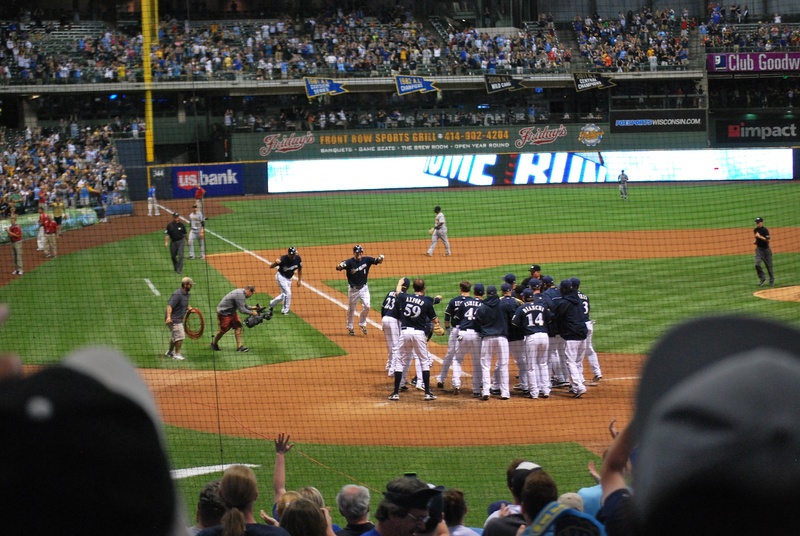 Final Score: Brewers 3 – Pirates 2. It’s past 10:00 AM on Sunday morning and I’ve got a long day ahead of me. After going to the 1:10 game at Miller Park I’m driving back to Fort Atkinson. I’m writing the post for Sunday, packing for the 7 day 7 game road trip and then I’m going to try and take a nap. I’m leaving my parents’ house at around 10:30 PM to drive to St. Louis. My flight leaves St. Louis at 6:30 AM and arrives in Miami just after 10:00 eastern time. The game in Miami is at 1:10 PM so I’m going to be cutting it close. Fingers crossed for no delays at either airport.